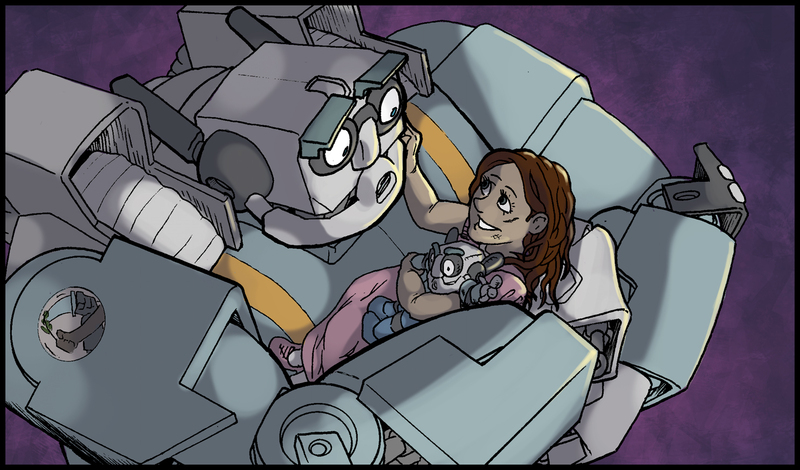 Have you hugged a robot today? This is all old news to anyone in this field, but it explains to anyone who wonders why they don’t hear from me for a few months at a time where I’ve been. I was a t home, covered in ink, crying softly onto bristol board. My current series, Father Robot, is starting to get some readership and reviews. Some are a little more critical than my fragile ego can handle happily (sniff), but almost all are fair and accurate. Here’s one where you can actually hear yours-truly talk about the book, at Panda Manga. 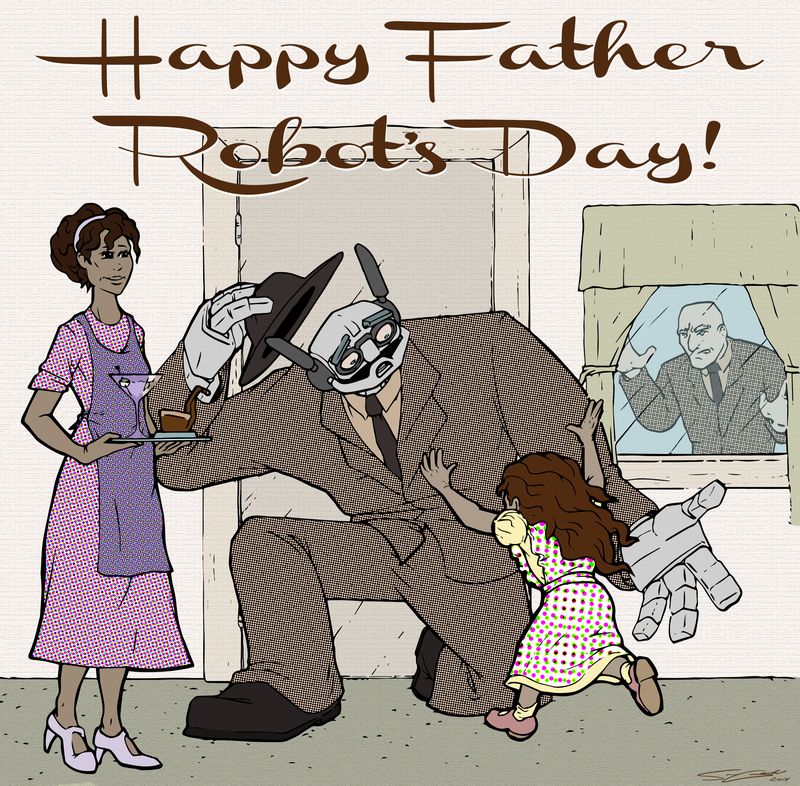 The writer and co-creator of Father Robot, Kristopher White, came up with a great idea to promote our book for Father’s Day. Basically, Father Robot should participate in an old-fashioned photo op for the holiday. I couldn’t help but taunt Reggie (the real father of Clarabelle, the heroine of the story) in the piece, as seen below. Both Kristopher and the publisher like a friendlier version, but I still like this tongue-in-cheek version. Available for your viewing pleaseure. It’s been hard waiting for this day, but it’s nice to finally see my comic available for purchase. Thanks to Kristopher White, the folks at Comixology, 215 Ink, and especially our supportive fans for making this possible. Please check out the available download here. 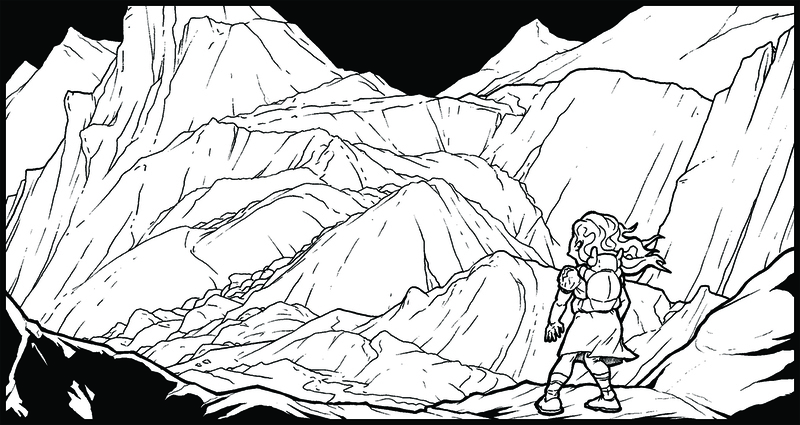 The best thing about issue 3 is all the rocky, outdoor settings. There’s something very freeing and satisfying about creating such abstract and unlimited environments. I used to be a professional geologist, and I guess a love-of-rocks is still part of me. In this panel, Clarabelle realizes that, despite how far she’s already come, she still has a long and difficult climb ahead of her. I certainly sympathize with her. Life seems to be a non-stop uphill, even when doing something as fun and satisfying as drawing. As much as I love making comics, sometimes I look at all the pages ahead and feel overwhelmed. If she asked, I’d tell Clarabelle, “In life, as well as when scrambling over mountainsides, just keep your focus on what’s right in front of you and worry about tackling the far-off slope once you get there.” Oh, and snakes. For the gods’ sake, watch out for snakes. 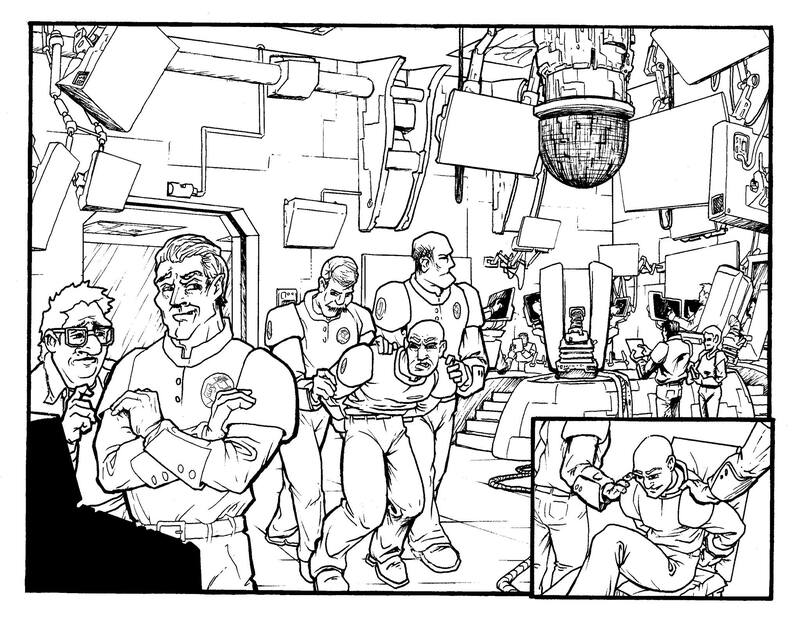 The final touches are going on to Father Robot issue #2, and I’m already working on the pages for issue #3. My minutes of free-time are few and far between these days, but I wanted to take some time to put another sneak-peek up. Colors by the outstanding Jenny Gosk. The pages for issue #2 came back from the colorist, the wonderful and talented Jenny Gosk, and I’m so excited! I’ve been working non-stop to put the finishing touches on everything, and now I can barely string two sentence together. So, here’s a sneak peak from the new work. ENjoy, and more soon! 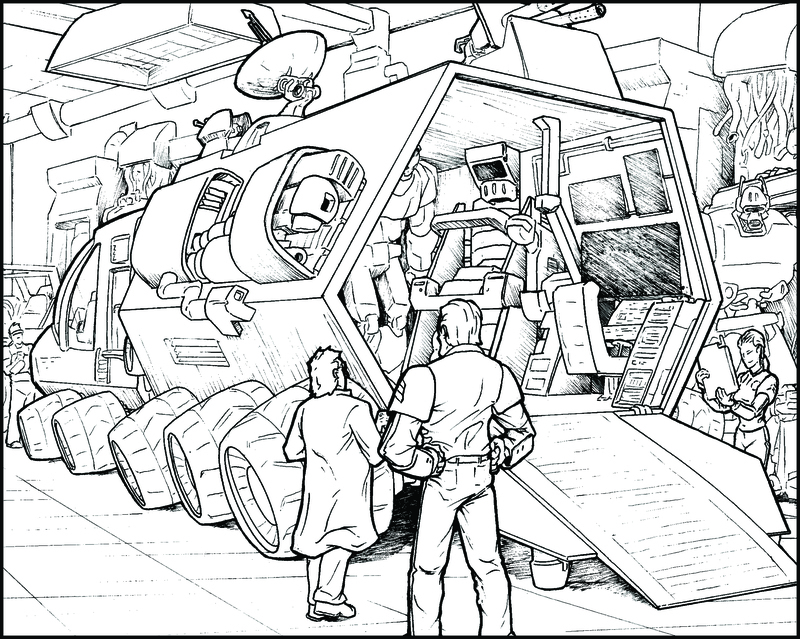 You might remember a concept sketch for this sci-fi truck going up a number of weeks back. 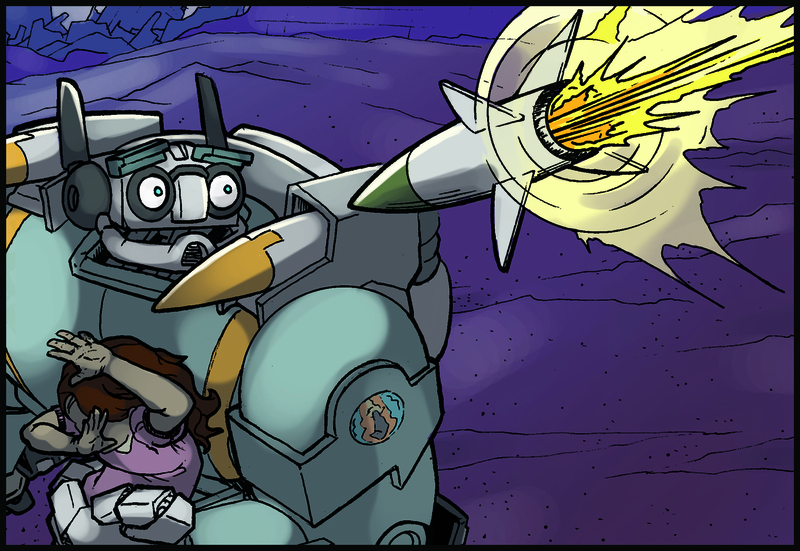 Well, here is a preview from its first appearance in Father Robot issue #2. The vehicle is to be a mobile lab, meant to bottle-up ol’ FR and find out what makes him tick. If you look real carefully, you might be able to get a peak at the big baddie whose time-to-shine is coming up soon. I don’t know how many of you who read this blog are also artists, or of those how many are comic book artists, or of those how many, like me, try to deliver a monthly book while working a full-time job doing something non-illustrative (and therefore pointless) all day, but you may now know that my life is frakin’ crazy. Pretty excited to make this announcement! As someone who typically has their head down over the drawing table, I’m always excited and somewhat surprised when I find such incredible progress made on the publishing and marketing side of things. Thanks to Kristopher White and the awesome folks at 215 Ink for making this happen. 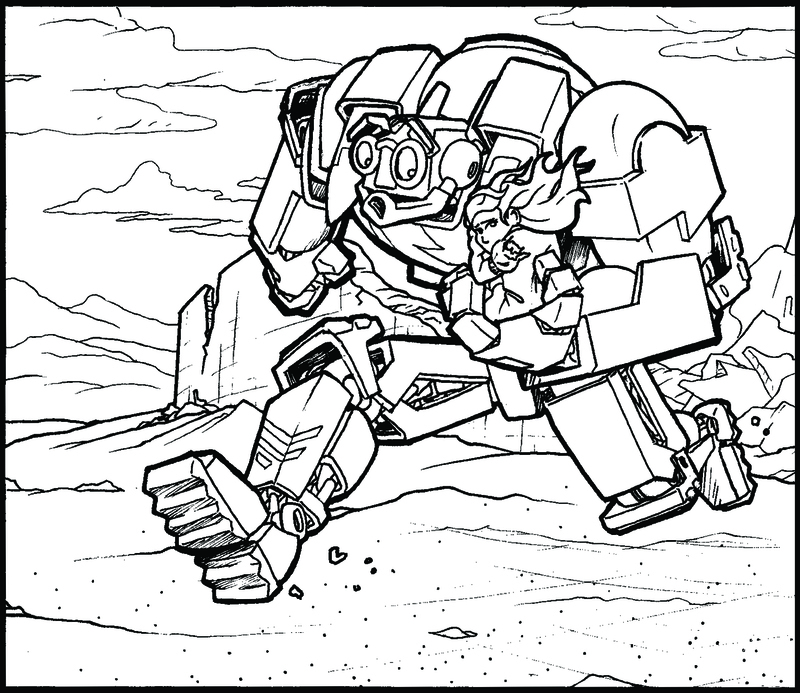 In case you haven’t seen it on the Father Robot website, here’s a preview of the line work from issue #2. Enjoy!